Yum! Could serve over rice or have on salad. Place chicken in crockpot and season with black pepper. In a medium bowl, combine, soy sauce, honey, ketchup, vinegar, garlic, sesame seed oil, onion powder and sriracha hot chili sauce. Pour over chicken and cook on low 3-4 hours or on high for 2 to 2 ½ hours. Remove chicken and shred with two forks and set aside. In a small bowl, dissolve cornstarch in the remaining 1/4 cup water, add to the sauce in the crockpot and stir to combine. Cover and cook on high until slightly thickened, about 15-20 minutes; return chicken to crockpot and mix well. Serve chicken over rice and top with sesame seeds and chopped scallions. A nice take on salsa verde. Zucchini is so versatile! Grill onion, poblano peppers, zucchini and tomatillos (could also use fresh jalapenos and grill those too). Grill 18-22 minutes or until lightly charred. 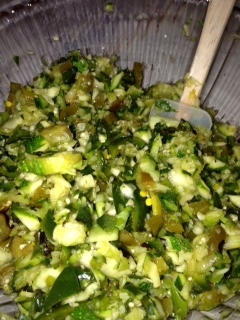 Finely chop or use a food processor to lightly chop. Transfer to a medium bowl and add remaining ingredients. Well, if 2 ingredients can be a recipe then this is one. A nice tart dessert. Preheat oven to 350F. 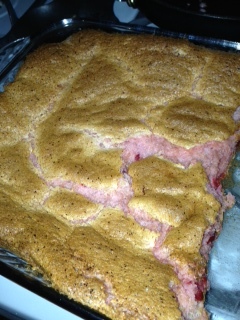 Combine cake mix with pie filling (do not add any other ingredients). Pour batter into ungreased 9X13 baking dish. Bake for 30 minutes. Preheat oven to 350*. Combine Bisquick and water (add additional water 1 tablespoon at a time if necessary. This will be a thick, sticky dough.) Place dough evenly in 6 muffin cups. 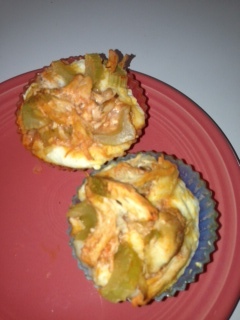 Combine chicken, wing sauce, blue cheese dressing and celery; top dough with this mixture. Press the chicken mixture into the dough a little. Bake 20 minutes or until lightly browned. A nice, light cupcake. One day I’ll brave the frosting too. But these aren’t bad with just Cool Whip Lite as a frosting. Preheat oven to 350*. Line a muffin pan with 2 liners. In a bowl, add egg white and Splenda and whisk until combined. Add in vanilla and olive oil and stir until mixed. Add Bisquick and stir until smooth. Stir in water (or could use skim milk). Divide batter equally between the 2 cupcake liners. Bake at 350 for 10-12 minutes, or until cake is set. Let cool completely, then frost as desired. This was really good. 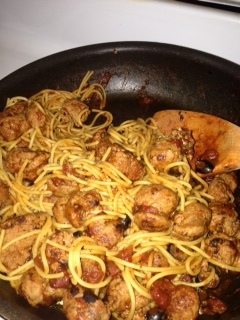 A grown up spaghetti. Cook spaghetti in boiling water. Meanwhile slice turkey links and cook in large skillet. After cooked add tomatoes and olives. Add cooked pasta and toss to combine. Yield: 4 servings. Per serving= 226 Calories; 4g Fat (14.1% calories from fat); 21g Protein; 31g Carbohydrate; 5g Dietary Fiber; 66mg Cholesterol; 913mg Sodium. This was easy to put together and tasted great. Preheat oven to 375*. Slice French bread dough about ½ inch thick and place on cookie sheet or pizza stone. Place close together in a circle shape. 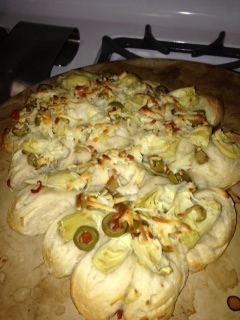 Top with artichoke hearts, olives and cheese. Bake 25 minutes or until lightly browned.